It’s no secret that fresh, homemade pasta is one of my favorite things in the entire world. But of course, the pasta is only half of the equation. The other half, is the sauce. And I believe that when you put time and love into making your own fresh pasta, you need a sauce that’s equally as worthy and delicious. And that’s exactly where this recipe for the best bolognese sauce ever comes in. *This post contains affiliate links. For more information, please see our disclosure. But hold on, because I know what you may be thinking. So let me address that real quick. How many times has the Internet promised you the “best” of something or other? And how many times has it actually been true? My guess is, not that many. But this? This will not be one of those times. I first learned how to make this sauce during an incredible cooking class in Italy. I then spent three (!) more years making, tweaking, and perfecting this recipe into what it is now. Whenever we bring our lasagna made with this bolognese sauce to parties, people go bonkers for it. 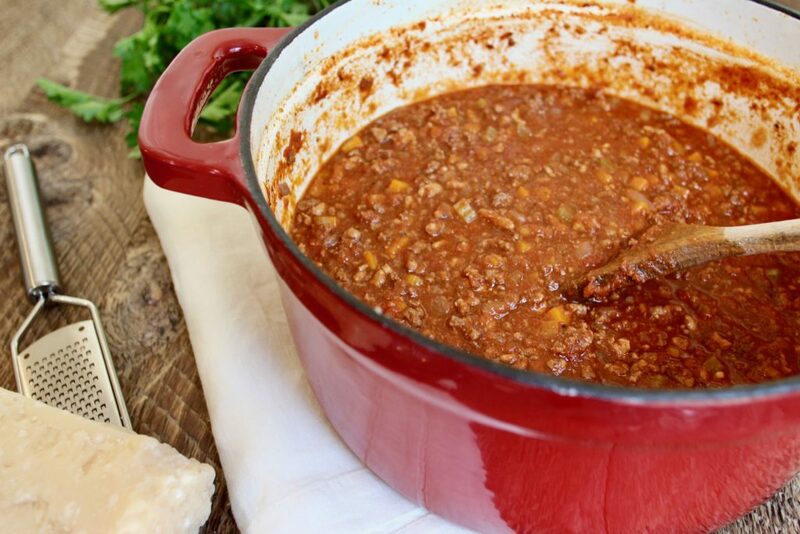 And so (so) many times, friends and family have said that this is the best bolognese sauce they’ve ever had. Convinced? → Good. Let’s make some bolognese sauce. Not convinced? → Even better. But please, before you taste this sauce, prepare to have your mind blown. Whether you serve this pasta with spaghetti or pappardelle or inside lasagna (this is what I recommend), one thing is for sure: fresh is the way to go. Click here for my authentic homemade pasta recipe. So now, let’s get to cooking! 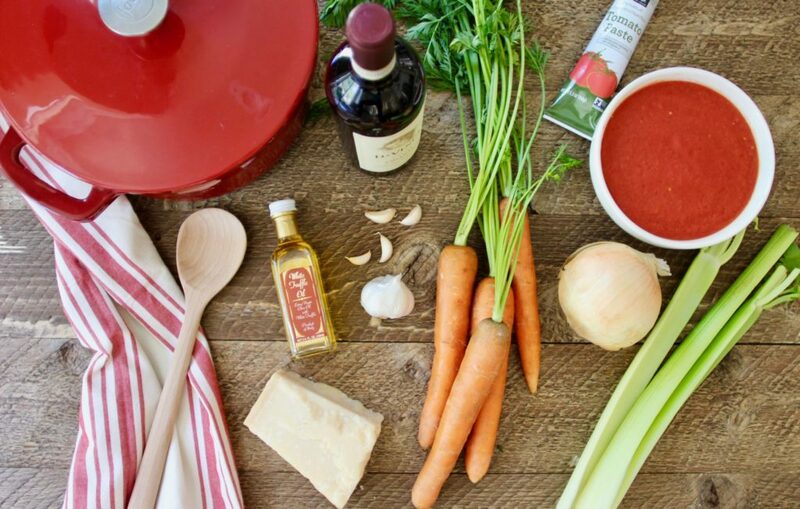 Who’s ready to make the best bolognese sauce ever? One of my favorite things about this recipe is that I usually have all of the necessary ingredients on hand. And chances are, you do, too! This recipe includes lots of kitchen staples, such as carrots, celery, onions, garlic, tomato paste, ground beef, and ground pork. However, there are three ingredients you may need to order from Amazon. And trust me, you can’t make this recipe without them. It just won’t be the same! These three ingredients — all produced in beautiful Italy — are going to send your bolognese sauce over the top. Firstly, there is no wine better to make an Italian sauce with than Chianti Classico. This red wine is a very earthy, rustic wine with notes of cherry and strawberry. It’s made from Sangiovese grapes from the best vineyards in the Chianti region of Tuscany. Chianti Classico is perfect for cooking this sauce — and it’s just as great to enjoy alongside your meal. Next, are these San Marzano tomatoes (whole-peeled and pureed). If you haven’t had San Marzano tomatoes before, they are going to change your life! Compared to Roma tomatoes, San Marzano tomatoes are longer and pointier, with thicker flesh and much fewer seeds; they also taste stronger, sweeter, and less acidic. You need these tomatoes in your life; and in all of your sauces! Lastly, is this beautiful truffle oil, made with black summer truffles from Northern Italy and high-quality olive oil. A small amount of this oil packs a huge flavor punch. In addition to the best bolognese sauce ever, you can use this truffle oil on pizza, risotto, sandwiches, mac ‘n’ cheese, french fries, popcorn, and more. Once you’ve gathered all of your ingredients, you’ve completed the hardest part. It’s smooth sailing from here on out, and we haven’t even started cooking yet! Firstly, finely dice your carrots, onion, and celery (your mirepoix). Once your oil is hot enough, add your mirepoix, your whole, smashed garlic cloves, some salt, pepper, and red pepper flakes, and cook for a few minutes — stirring often. Next, throw in your ground pork and ground beef, and season it with some salt and pepper. As the meat cooks, stir and break it up into small chunks. Then add in the tomato paste and continue to stir for a few more minutes. Now stir in the wine, and be sure to scrape up all the browned bits! Then let the wine cook down for a few minutes. Add in the San Marzano tomatoes, broth, and cheese rind. Season with more salt, pepper, and red pepper flakes and stir. Then bring the sauce to a boil, lower the heat, and simmer for three hours! After three hours of simmering, it’s time to turn off the stove and taste your marvelous sauce. But don’t get too excited, because you’re not done yet! Now, you’re going to remove the what’s left of the parmesan cheese rind and garlic cloves, and add in the balsamic vinegar and sugar, as well as salt and pepper to taste. Lastly, finish off your bolognese with a healthy drizzling of black truffle oil. Garnish with some fresh herbs (like parsley and/or basil) and high-quality parmesan cheese shavings, and serve! Now that you know the ingredients and the process behind making the best bolognese sauce ever, what are you waiting for? 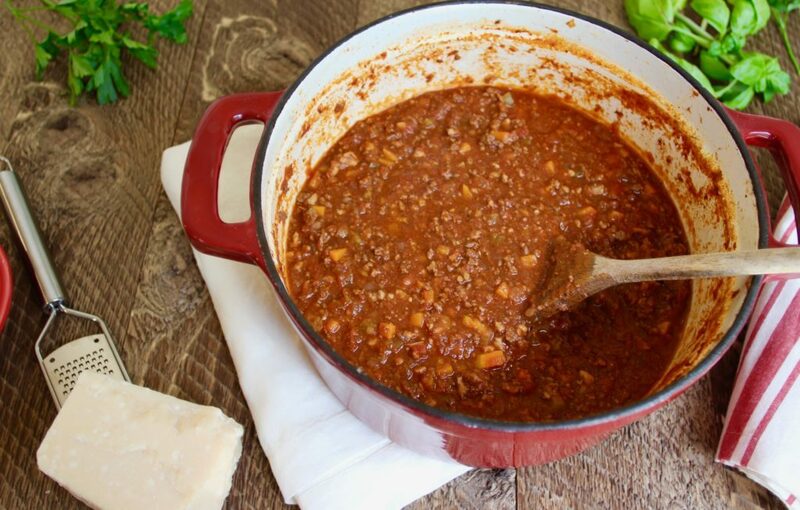 With the rich, complex flavor combination of sweet carrots and spicy garlic, ground beef and pork, Chianti wine, earthy black truffles, and beautiful San Marzano tomatoes, I know for sure that you, your friends, and your family are going to love this bolognese sauce. 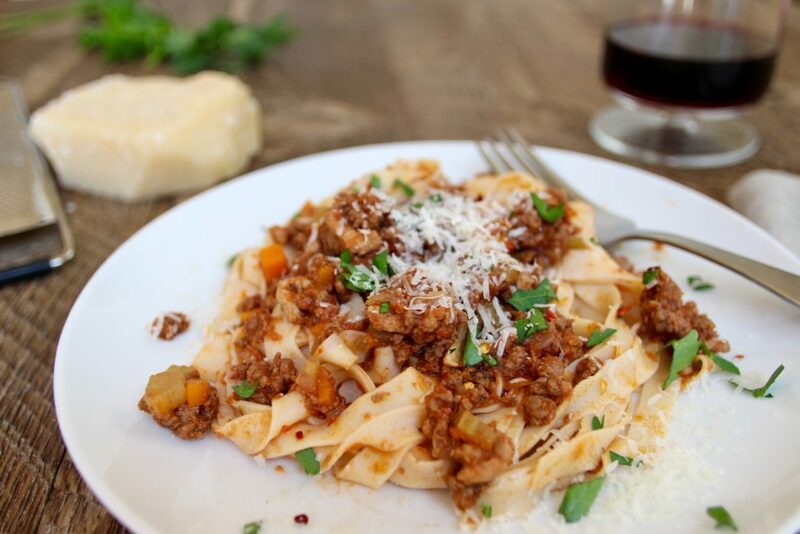 This slow-cook bolognese recipe allows for the rich flavors of beef and pork, San Marzano tomatoes, sweet carrots, Chianti Classico wine, and black truffles to marry and develop into the best bolognese sauce ever. Try it out! You will not be disappointed. Add in wine. Stir in and scrape up all the browned bits from the Dutch oven. Let wine cook down for two minutes. Bring to a boil, lower the heat, cover, and simmer for three hours. Garnish with parsley, basil, grated cheese, etc. and enjoy! I recommend using this Chianti Classico wine, these whole-peeled and pureed San Marzano tomatoes, and this black truffle oil. This sauce is best enjoyed with fresh pasta. Click here for my authentic homemade pasta recipe. If you like creamier pasta sauce, simply stir in a cup of whole milk or heavy cream at the end. I recommend using your fresh pasta sheets to make a lasagna with separate layers of this bolognese sauce and a ricotta-mozzarella-spinach mixture, and then a béchamel sauce on top. This sauce yields at least 8 servings (if you were to combine it with past alike spaghetti or pappardelle). If you can make this a day or two ahead of serving, I recommend doing so. As the sauce sits in the fridge, the flavors keep on developing and the sauce gets even more delicious! 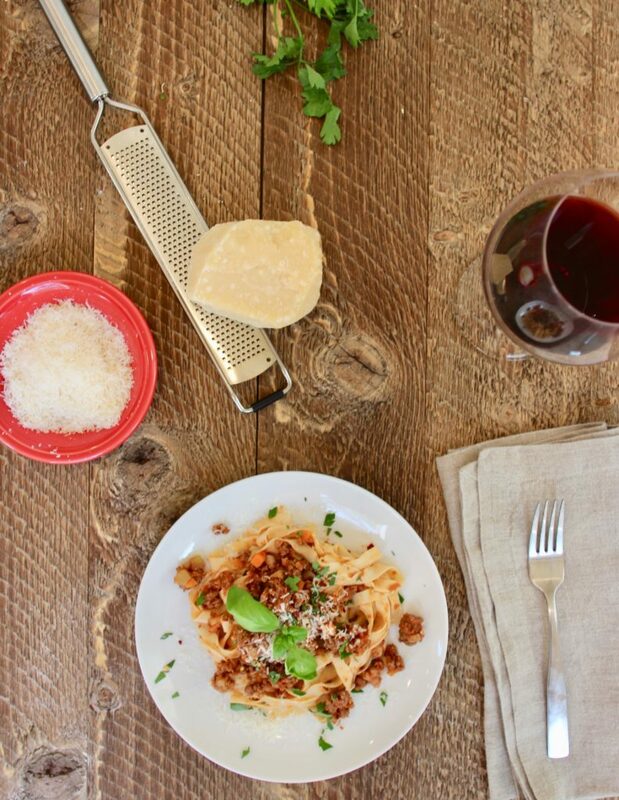 Did you try out our bolognese recipe? Do you have a question or comment? Let us know in the comments section below! Oooh, I do love me a good pasta sauce! TBH, I’m not a huge fan of truffle, but I’m sure I’d love this sauce nonetheless! Well, it’s only a 1/2 tsp, so it’s a very subtle truffle flavor. You could easily leave it out if you don’t like truffle… But I definitely recommend using it! It looks delicious. I have never had much success with Bolognese, it always dries out. The recipe I have used included milk and white wine. I think I will give your recipe a try. Mine turned it very thin will it thicken as it sits still next day? Or how can I thicken it? Did you allow it to slow cook long enough? It does thicken as it sits in the refrigerator. An option could be adding a slurry of corn starch and water to thicken, though note that we have never tried this before. Yikes, just making this now…the way it looks showing up on my phone I thought it was 5 cups. No wonder it’s so watery….